I’ve decided to diversify a little and include non-sweet recipes on this site as well, hence the change in the tagline at the top (which I know is very faint and small but I don’t think I can change that!). 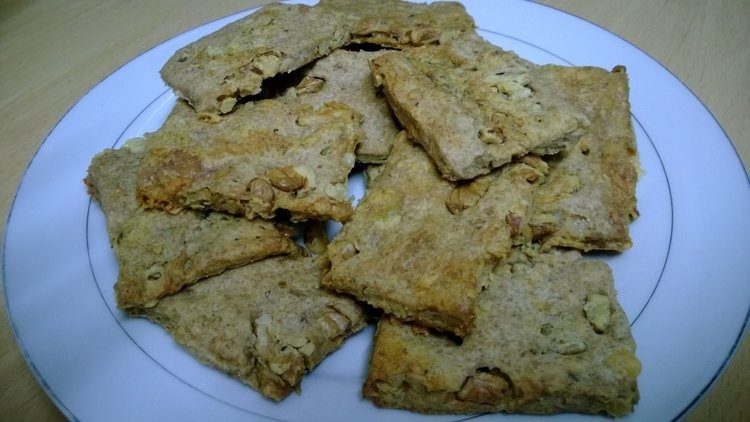 I had the urge to make something out of walnuts and blue cheese this weekend, so I adapted this recipe for multiseed crackers that I found on the BBC Food website, although my final recipe bears very little resemblance to the original! 1) Mix the flours, salt, pepper, sugar, and walnuts together. 2) In separate bowl, whisk the water and oil together. Stir in to the dry ingredients and mix until it forms a dough. 3) Knead the dough for five minutes on a lightly floured surface. Add the crumbled blue cheese and work it in just long enough until it is spread fairly evenly through the dough; you should still be able to see the pieces of blue cheese – if you work it too much the blue cheese will disappear into the dough. 4) Return the dough to the bowl, cover and set aside for 20 minutes. 5) Preheat oven to 180C/375F. 6) Line baking trays with baking paper. 7) Oil the work surface and roll the dough out. The size of the walnut pieces will dictate how thin you can roll it. If you want your crackers to be thin and delicate like in the original recipe that I linked to, then your walnut pieces will need to have been chopped much more finely, but I wanted more chunky rustic crackers. 8) Using a ruler and a sharp knife cut the dough into rectangles. 9) Place on to the prepared trays, and lightly brush some oil on top. 10) Bake the crackers for 18-20 minutes (less if you’ve made the very thin version). Then turn the oven off and leave the trays in there for another 15 mins to help them crisp up further (the original recipe said that you should open the oven door for 30 seconds to let some heat out first before leaving them in there for 15 mins, but if you have a fan oven, as I do, then I don’t think it’s necessary because fan ovens cool down pretty quickly anyway). 11) Place them on a wire rack to cool, then transfer them to an airtight container. I like these as a snack just on their own, but they are quite dry, so you may like to spread a bit of butter on top, or they are also nice with some chutney, or for us Brits, some Branston Pickle. if I was serving them to guests, I might cut the dough into narrower strips so that they are more like sticks that could be served around a bowl of chutney to dip into. The stronger and saltier the better with cheese for me! I’m guessing you don’t really like Halloumi cheese either which is another favourite for me. I’m going to play around with this recipe a bit though and try different flavour combinations and different ways of cutting them, maybe little bite size ones. It’s a cheese from Cyprus. It’s not stinky but it’s very salty, it’s very firm and rubbery and doesn’t melt, so it can be cooked in ways that you can’t normally cook cheese, like it gets sliced and fried, or cubes of it can be put on skewers along with cubes of veg and then grilled, that kind of thing. So the walnuts aren’t rustic? It’s the crackers? Sorry, I must have got the wrong end of the cracker. p.s. my logo looks good, eh? These look scrumptious. No calories, you say? I must try a batch. All my favourites are in this recipe. Er, I’m afraid I’ve never developed a taste for the moldy cheeses. But the concept sounds interesting, and I’ll bet others would find these very tasty. 🙂 And I like the way you’re mixing up the recipes with some non-sweets, too. Sweet and salty makes a great combination! Yeah, I think blue cheese is pretty much a love it or hate it thing! I love cheese, I can’t actually think of any cheese that I don’t like, and the stronger the better! I love blue cheese! It’s one of my favorites, precisely because it is strong and salty. I’m the same way about my fish — give me salmon over haddock any day. Those crackers look delectable. With Thanksgiving coming up, maybe I’ll try to make some for an appetizer. We shall see if I can swing it! They sound very rich and good. I’ve made walnut and blue cheese tarts that were popular at an event. Anything with blue cheese and I’m there!